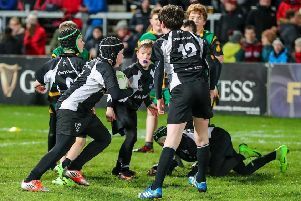 Banbridge Under 14s travelled to Coleraine in good spirits and came away 26-12 winners to record their third league win of the season. Bann started the brighter and eventually the pressure told when Lewis Kemp skipped over for his first try of the afternoon. This was soon followed by the centre’s second and Jackson duly converted. Just before half time, Will Cromie opened his account for the season. With 15 minutes left, Jack Sherrard scored his obligatory try. Again Jackson converted. Man of the Match was Declan Brady.